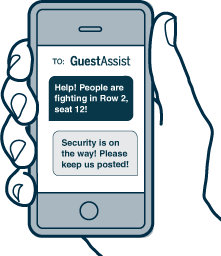 GuestAssist delivers enterprise-to-customer, mobile phone based communications that takes your service experience to the next level. With GuestAssist's real-time responsiveness, you make life easier for you and your guests and a satisfied customer is a loyal customer. "Our soccer fans are our most valuable assets, and providing each guest with the safest and best possible experience watching their team is paramount in our objectives."